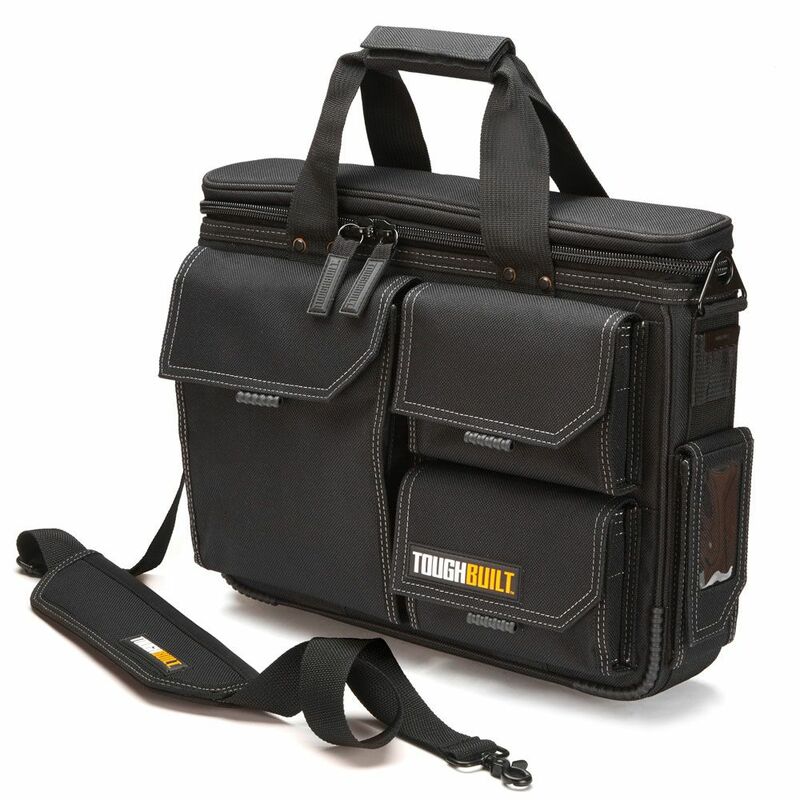 The ToughBuilt Quick Access Laptop Bag + Shoulder Strap (Medium) is designed to organize and protect your 13 inch -17 inch laptop and accessories in the field. Rugged HardBody construction is combined with thick padding to make sure everything stays safe.Unique exterior pockets allow quick access to everything you carry. The largest pocket is padded and a perfect fit for the iPad Organizer + Grid Notebook (TB-56-IP-C) or ToughBuilt Organizer + Grid Notebook (TB-56-L-C). The zippered lid reveals a padded laptop pocket file dividers. Under the lid is an additional accessory pocket for smaller items. Also includes and tape measure clip and business card pocket. By adding a patented ClipTech Hub to the side, professionals have the never-before-seen option of effortlessly clipping one of the many ToughBuilt tool pouches from the bag to belt to fit every job. This Super Heavy Duty 42 inch. Canopy is BU.jpgilt to last with thicker steel and stronger design for rugged work environments that a Professional would experience. It's a great solution for your tool organisation needs. This Super Heavy Duty 54 inch. Canopy is BU.jpgilt to last with thicker steel and stronger design for rugged work environments that a Professional would experience. It's a great solution for your tool organisation needs. The ToughBuilt 2in1 Knee Pads are the versatile lightweight solution. Knee Pads can be worn with or without the hard shells. Hard shells are made of rugged, hard-wearing, shatter-resistant plastic for use on rough terrain. The thick molded pads are made with soft, durable, non-marring foam keeping more delicate surfaces scratch free. Can be worn under or over pants. Comfortable single elastic strap hugs the calf, and avoids bunching behind the knee for all-day comfort. Quick Access Laptop Bag + Shoulder Strap - Medium The ToughBuilt Quick Access Laptop Bag + Shoulder Strap (Medium) is designed to organize and protect your 13 inch -17 inch laptop and accessories in the field. Rugged HardBody construction is combined with thick padding to make sure everything stays safe.Unique exterior pockets allow quick access to everything you carry. The largest pocket is padded and a perfect fit for the iPad Organizer + Grid Notebook (TB-56-IP-C) or ToughBuilt Organizer + Grid Notebook (TB-56-L-C). The zippered lid reveals a padded laptop pocket file dividers. Under the lid is an additional accessory pocket for smaller items. Also includes and tape measure clip and business card pocket. By adding a patented ClipTech Hub to the side, professionals have the never-before-seen option of effortlessly clipping one of the many ToughBuilt tool pouches from the bag to belt to fit every job. Quick Access Laptop Bag + Shoulder Strap - Medium is rated 4.7 out of 5 by 15. Rated 5 out of 5 by chosebine1200 from Looks sturdy I would prefer one full compartment instead of pockets in front with some kind of tool organizer system in there. I really like the long pocket on top it's perfect for long slim tools that wouldn't fit anywhere else. If the brand gets popular I would suggest that they make it modular so you can pick and choose some extensions that we could add or remove with a sturdy zipper. And of course put some thought in the extensions consulting the tradesmen that uses it. Rated 5 out of 5 by Michael from Sturdy construction meets the needs of the jobsite with plenty... Sturdy construction meets the needs of the jobsite with plenty of room for notepads, documents, other items. Exterior quick access pouches are great for storing things like chargers, gloves, glasses, small tools or whatever else you might need. Rated 3 out of 5 by James from The bag is good quality construction with questionable design. ... The bag is good quality construction with questionable design. It does not stand by itself at all, and constantly falls flat on the floor every time. The length is good for large atlases and laptops, but otherwise too long for practical purposes. I returned the bag for a refund.